Cost to Tarmac My Driveway in 2019? Tired of a driveway that gets muddy when it rains? Can’t stand the puddles of water and the potholes forming in your path and just want to find a permanent solution? Tarmacing your driveway is the answer. With tarmac, you can enjoy a durable surface for at least 15 years maintenance-free. Tarmac is not just an ideal way of enhancing the look and appeal of your home; it’s also a way to increase your property value too. For a new tarmac driveway, installation prices can vary from £50 to £65 per square metre. However, this is a rough estimate because your final quote will depend on a variety of factors a tradesman can determine following a site visit. When choosing a paving contractor always ensure they are insured, are part of a recognised trade body and have checkable references. To learn more about what is involved, please keep reading. Low Cost – Tarmac driveways cost less per square meter than other types of driveway surfaces. Costs will vary depending on whether it’s a fresh installation or a resurfacing job. Durability and weather resistant – tarmac will last more than 15 years if properly taken care of, with little need for maintenance. Tarmac also performs better in the colder weather we experience throughout the UK. Quick and easy to install – installing a tarmac driveway is a straightforward process, and although it requires specialised equipment, it can be completed within a couple of days. Of course, the size of the driveway to be tarmacked is a factor in determining how long the job takes. Low-cost maintenance – apart from patching up any areas affected by weather or excessive traffic, tarmac driveways are long lasting and durable. There you go, four top benefits for you to enjoy when you choose a tarmac driveway over the other surfacing options. Next, the question “how much does tarmac cost” is addressed below. Can I tarmac my driveway or do I need a professional? 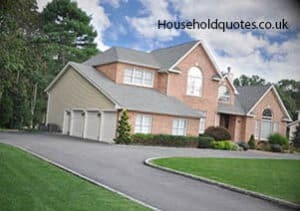 Get Your FREE Driveway Quotes NOW! The gradient of the land. The condition of existing driveway surface and whether excavation work is required. The size of an area to be covered. Knowledge of driveway construction process and the properties of tarmac (how to use it safely and handling procedures). As you can see, unless you are up to the task, there are a lot of moving pieces that require fitting perfectly for you to have a long-lasting, hassle-free tarmac driveway. Finding a professional with a proven track-record and the necessary skills to carry out a perfect job is the way to go. The costs will, of course, be different and you should expect to pay slightly more for a new tarmac drive. However, below we provide a breakdown of each component or phase of the drive laying process, so there is transparency on what it is you are paying for. Excavation and removal of existing driveway surface. Install high-grade membrane to prevent weed growth. Next, edging is laid on a sand and cement base. Depending on the shape and size of the driveway, this stage will usually take the longest. The sub-base is laid next and then compacted either manually or mechanically. The binding course (first layer of tarmac) is laid by hand or machine, and a roller is used for compaction. A surface course is applied and compacted using a roller to create the smooth final finish. Finishing touches and site clearance including taking away all the rubbish. If you get a free quote with Rated People, they do most of the work for you e.g. checking insurance, certifications and collecting reviews. It is one of the best places to get different tradesmen competing for your job, which helps to ensure you always get a competitive quote.